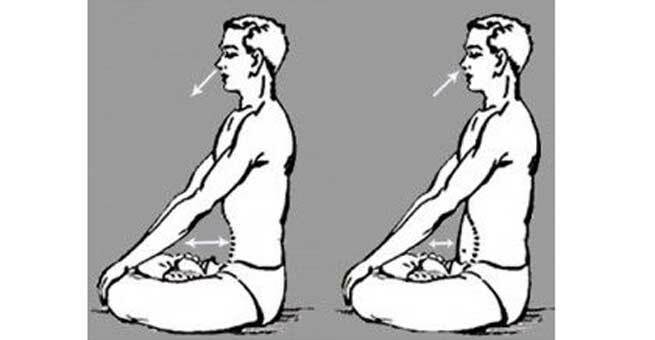 Kapalabatti-Pranayama is a very powerful and important breathing exercise that not only cures stomach disorders but also helps in losing the belly fat. It is a good asana even for relaxing of mind and body. Sit straight with back erect. Do not take any back support. Place your palms comfortably on the knees. Inhale or take a deep breathe from both nostrils until the lungs is filled with air. Now exhale with full pressure so that the stomach goes deep inside. Pull your stomach inside as much comfortable for you as possible. You should feel little pressure on stomach when pulled inside. Repeat the same atleast 10-20 times in a day. Helps in reducing belly fat. Also helps in getting good oxygenated blood through out the body. It also strengthens abdominal muscles. Clears the nostrils. Also helps in uplifting of mind and control on mind. Helps in curing respiratory diseases like asthma, breathing problems. Helps in the function of pancreas, thereby helps in controlling diabetes. People suffering from high blood pressure any heart disease, stroke, epilepsy should avoid doing this asana until consulted by a physician. Women during mensuration should avoid as it involves high abdominal activity.